Roots hold the tree up. 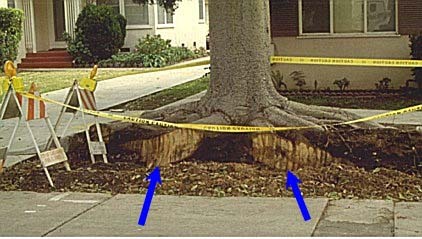 It is important that roots under the canopy are not cut. When roots under the canopy are cut or large roots decay, trees can fall over, sometimes in a dramatic fashion (right photo, courtesy of Andy Kitsley). 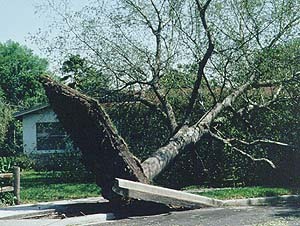 The huge cuts on the tree below can kill the tree or could cause it to fall over. Never cut roots closer than the distance of 5 times the trunk diameter. Decay can result and trees could fall over (lower-right photo). 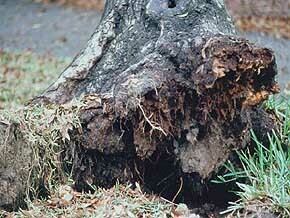 Compacted clay soil, high water table and hardpans can restrict roots to shallow depths and can result in unstable trees.